BOTOX® has been licensed for use for over twenty years, initially being used for straightening eyes in cases of squint, or for use in spasms in the neck or facial muscles. 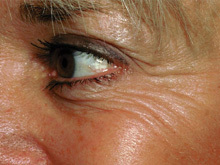 BOTOX® is now licensed for use in treating frown lines, forehead furrows and crow’s feet. BOTOX® is a protein, which locally prevents the nerves from activating the muscles in a reversible way, for up to six months. It is often referred to as a toxin, however this is only in the context of massive doses, many hundreds of thousands of times the dose that we use – this is the case with almost all medicines that are prescribed. I prefer to describe it as a wrinkle relaxing protein. Sometimes by careful management in several of these areas, a brow lift can be achieved – the so called “chemical brow lift”. 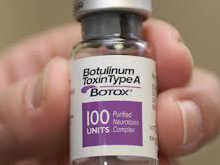 With BOTOX® there is minimal recovery time. This lady has had treatment for her Crow’s feet. 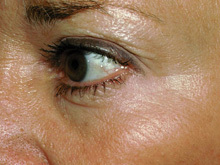 Maximum effect occurs after about two weeks and lasts up to 6 months. Have a question? Contact Dr Heyworth or make an appointment NOW!